The School has clearly defined emergency evacuation procedures and a designated Crisis Management Team (CMT) responsible for managing all emergency situations. Evacuation drills are carried out periodically. In the event of any emergency, the CMT communicates with parents regarding the procedures for collecting students. The School is covered by a private medical service – SEMM - which provides 24/7 emergency response for ALL individuals (students, staff, visitors) when on the School site or on School trips/visits. There is always a Medical professional present able to provide First Aid. In accordance with local law regulations, all students are required to present a valid Certificado del Niño/a (ages 4 to 11) or Certificado del/de la Adolescente (ages 12 to 19) prior to admission into School – and renewed annually thereafter. This certificate is issued by the individual student’s Paediatrician or GP and must include all vaccinations required by local health and educational authorities. This certificate (if complete) allows the student to participate in P.E. activities and weekend sports. Senior School students who participate in competitive sports organised by local sporting bodies may need to obtain their Certificado de Aptitud Deportiva at the Centro Médico Deportivo del Ministerio de Deporte. The certificate must be presented annually (in March). The School does not carry out any screening for Headlice in School. The School requires that all students wear their hair neatly groomed – short hair for boys and long hair tied back for girls. Early detection and treatment of head lice is vital to minimising their spread and the School relies on the help and support of families in this regard. Parents are encouraged to check their child/children’s hair regularly for headlice and to carry out the recommended treatment at home. Head lice are very contagious and it is important that, if detected, the treatment must be applied to all members of the family. Please enjoy the School facilities in safety. 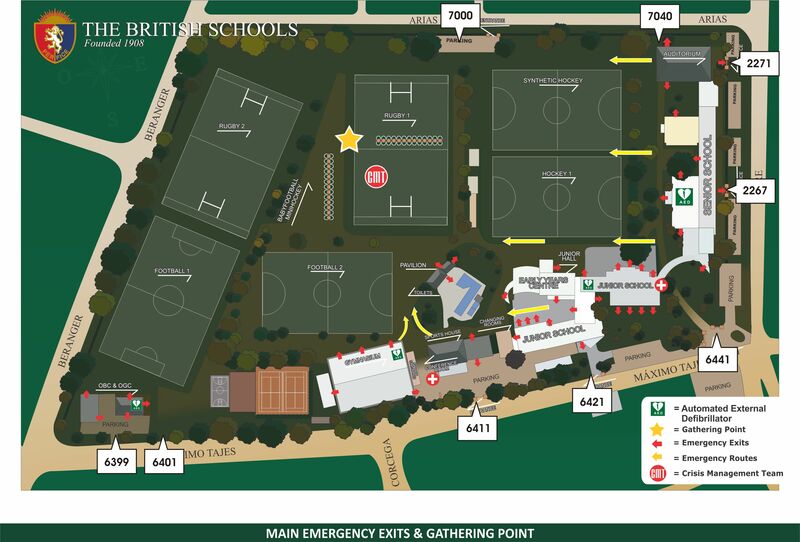 Parents and guardians are reminded that they are responsible for the supervision of their children at all times when using The British School’s facilities during After-School and Weekend Activities. The British School’s community enjoys the privilege of its beautifully landscaped, well maintained, grounds and facilities. It is the responsibility of each one of us to help keep these grounds and facilities clear of litter for everyone to enjoy.